Death*: She died on 31 May 1960 at Chicago, Cook, Illinois, USA, at age 70. 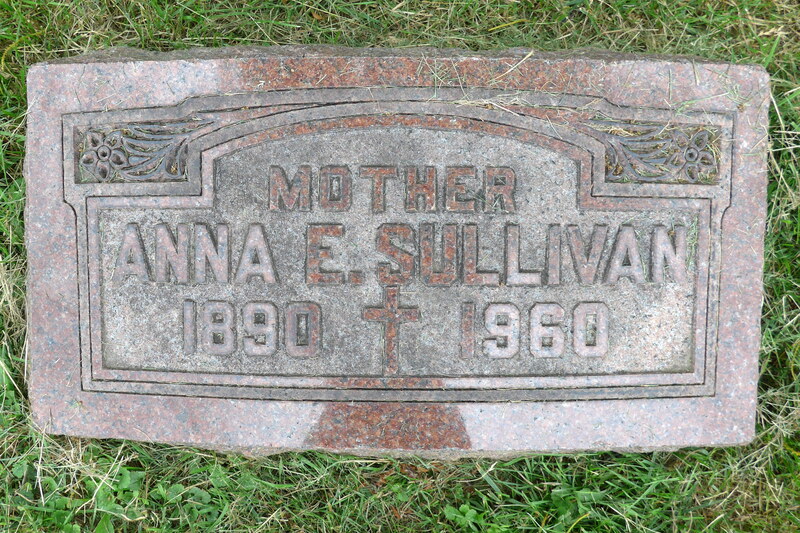 Annie E. Sullivan of 662 Wellington avenue, May 31, 1960, wife of the late Peter I. Sullivan; mother of George P. Sullivan; grandmother of Peter, Patrick, Dorothy, Charles, Mary and Kevin. At chapel, 5501 N. Ashland avenue, where services will be held Friday, June 3, at 11 a.m. Interment Graceland LO 1-2645. [S468] Chicago Tribune, 6 April 1937, p. 14. [S683] Peter I. Sullivan Cemetery Grave Card, Graceland Cemetery, Chicago, Illinois, Maplewood Section, #516. [S900] Sullivan-Stange Marriage License: No. 699145. [S1138] George Peter Sullivan, Illinois birth certificate no. 24707, Family Search Record Search, accessed, March 10, 2010 (August 2, 1916). Marriage*: He married Anna Houl? [S602] George F. Stange, Illinois certificate of death, Family History Library, MF#1877731. [S1769] 1940 US Census, California, Alameda County, Alameda City, Washington, DC, ED 1-10, Page 16A, Ancestry.com, Accessed August 8, 2013. [S309] US Social Security Death Index, 1935-Current, Ancestry.com, Alan R. Steidley, accessed August 8, 2013. [S1812] Steidley-Bentall Marriage Certificate, Book 3912, Page 177: FamilySearch.org, accessed August 15, 2012. [S1776] U. S. City Directories, 1821-1989, Long Beach Directory, Burke F. Steidley entry, accessed August 8, 2013. [S1776] U. S. City Directories, 1821-1989, Long Beach Directory, page 674, Alan R. Steidley entry, accessed August 8, 2013. [S1813] Patricia Morales Tijerino, "Francisca (Frances) McIntire and a little more...," e-mail to Elaine McIntyre Beaudoin, August 12, 2013; 10:09 a.m., Email contains six photos. [S981] California Births, 1905-1995, online www.californiabirthindex.org, Burke F. Steidley, Ancestry.com, accessed August 8, 2013. [S1773] 1930 US Census, California, Alameda County, Oakland, Washington, DC, ED 48, page 17A, Ancestry.com, accessed August 8, 2013. [S309] US Social Security Death Index, 1935-Current, Ancestry.com, Burke Frandsen Steidley, accessed August 8, 2013. [S411] California Death Index, online Ancestry.com, Burke Frandsen Steidley, accessed August 8, 2013. [S1771] U. S. City Directories, 1821-1989, Oakland City Directory, page 996, accessed August 8, 2013. [S2111] Long Beach Independent, June 30, 1946, Page 24, Accessed on August 8, 2013 in newspaperarchive.com. [S1776] U. S. City Directories, 1821-1989, Long Beach Directory, page 674, Burke F. Steidley entry, accessed August 8, 2013. [S981] California Births, 1905-1995, online www.californiabirthindex.org, Don Herbert Steidley entry, Ancestry.com, accessed August 15, 2013. [S2724] Patricia Morales Tijerino, "Don Steidley's passing," e-mail to Elaine Beaudoin, October 30, 2018, Included an email forwarded from Emily Steidley Bushong, daughter of Don Steidley, dated October 28, 2018.